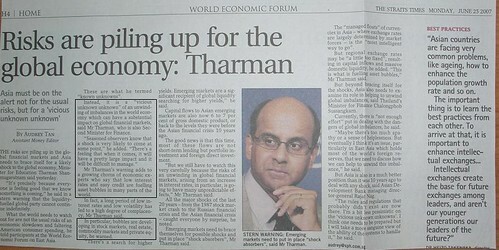 I mean it when I say I truly admire the wisdom of Minister Tharman. Other than he has prudently managed the national finance over the last few years, he had correctly predicted the the financial tsunami when the world was enjoying a boom like it will never end and hitting its peak around early 2008. Remember this speech was given in Jun 2007, almost 21 months before the Lehman’s Brother collapse which triggered chians of events that almost brought down the entire world financial system. [Updated 25 Jul 2011 and 2 Sep2011]: Tharman has predicted (Jul 17 2011 The Straits Times) that there will be mini-shocks and a sluggish economy in the coming months but unlikely a financial disaster of the like of Lehman’s Brother collapse and the ensuing events. We shall review this statement in 2-3 years time. Tharman also spoke at the World Bank Infrastructure summit in Singapore that he agreed with World Bank President Robert Zoellick’s view that “the world economy has entered a dangerous new phase and that the possibility of global recession now was more likely than not. “Incidentally, The Rich Dad Poor Dad author Robert Kiyosaki has predicted a major financial disaster by 2016 due to the over-printing of US dollars by Uncle Sam. The two events are related but the timelines differ. THE risks are piling up in the global financial markets and Asia needs to brace itself for a likely shock to the global economy, Minister for Education Tharman Shanmugaratnam said yesterday. ‘It’s precisely because everyone is feeling good that we know something is coming,’ he said in a stern warning that the liquidity-fuelled global party cannot continue indefinitely. What the world needs to watch out for are not the usual risks of an economic slowdown and faltering American consumer spending, he told participants at the World Economic Forum on East Asia. These are what he termed ‘known unknowns’. Instead, it is a ‘vicious unknown unknown’ of an unwinding of imbalances in the world economy which can have a substantial impact on global financial markets, said Mr Tharman, who is also Second Minister for Finance. Mr Tharman’s warning adds to a growing chorus of economic experts who say that low interest rates and easy credit are fuelling asset bubbles in many parts of the world. In fact, a long period of low interest rates and low volatility has led to a high degree of complacency, Mr Tharman said. In particular, bubbles are developing in stock markets, real estate, commodity markets and private equity, he warned. ‘There’s a search for higher yields. Emerging markets are a significant recipient of global liquidity searching for higher yields,’ he said. Capital flows to Asian emerging markets are also now 6 to 7 per cent of gross domestic product, or back to the levels they were before the Asian financial crisis 10 years ago. The good news is that this time, most of these flows are not short-term lending but portfolio investment and foreign direct investment. ‘But we still have to watch this very carefully because the risks of an unwinding in global financial markets, arising from an increase in interest rates, in particular, is going to have many unpredictable effects,’ Mr Tharman said. All the major shocks of the last 20 years – from the 1987 stock market crash to the Russian financial crisis and the Asian financial crisis – caught everyone by surprise, he noted. Emerging markets need to brace themselves for possible shocks and put in place ‘shock absorbers’, Mr Tharman said. The ‘managed floats’ of currencies in Asia – where exchange rates are largely determined by market forces – is the ‘most intelligent way to go’. But regional exchange rates may be ‘a little too fixed’, resulting in capital inflows and massive domestic liquidity, he added. ‘This is what is fuelling asset bubbles,’ Mr Tharman said. But beyond bracing itself for the shocks, Asia also needs to examine its role in helping to unwind global imbalances, said Thailand’s Minister for Finance Chalongphob Sussangkarn. Currently, there is ‘not enough effort’ put in dealing with the dangers of global imbalances, he said. ‘Maybe there’s too much apathy or a sense of helplessness. But eventually I think it’s an issue, particularly in East Asia which holds most of the world’s foreign reserves, that we need to discuss how we can help to unwind this imbalance,’ he said. But Asia is also in a much better position than it was 10 years ago to deal with any shock, said Asian Development Bank managing director-general Rajat Nag. ‘The rules and regulations that probably didn’t exist are now there. I’m a bit less pessimistic on the ‘vicious unknown unknowns’. I think one needs to be prepared but I will take a more sanguine view of the ability of the systems to handle it,’ he said.